Tern took their name from the bird with the world’s longest migration. The Arctic Tern flies 44,000 miles a year and over 1.5 million miles in its lifetime. 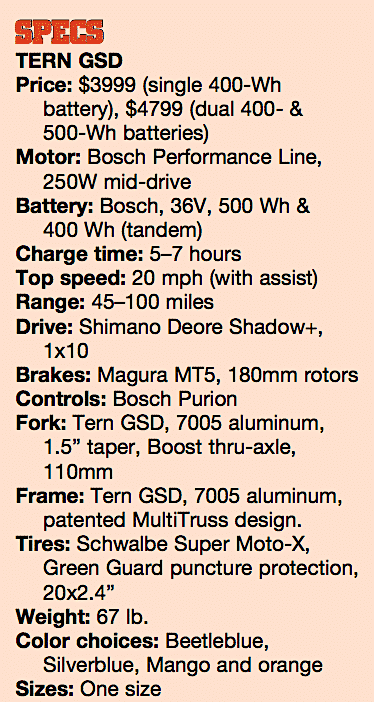 Tern takes this as a guiding philosophy to build long-lasting, quality bikes. When the GSD was shown last year, we were impressed by the versatility and utility designed into it. 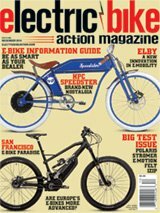 A test ride showed that it handles as well as it functions, and we looked forward to living with one for a while to see what it was like. The GSD with optional saddlebag and seat. 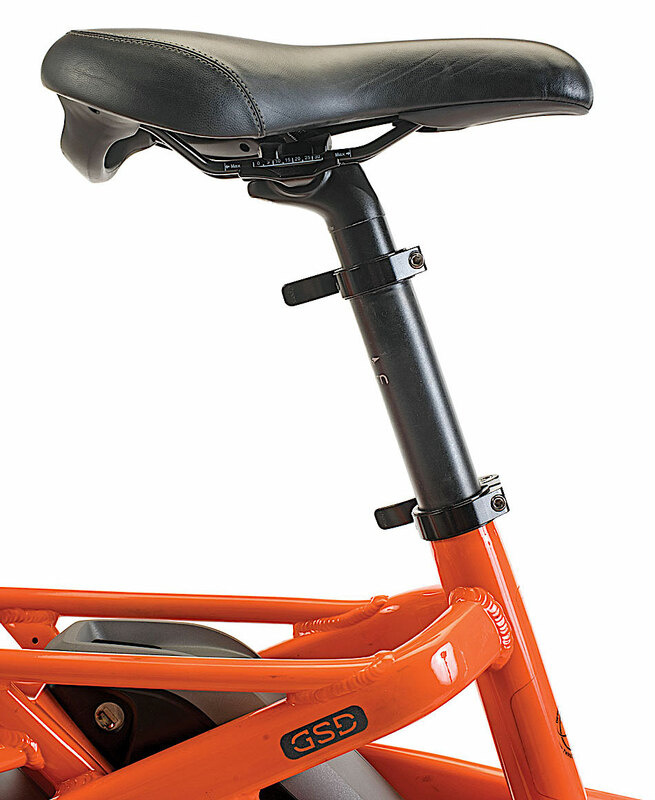 The seat can be mounted fore or aft on the top of the frame. 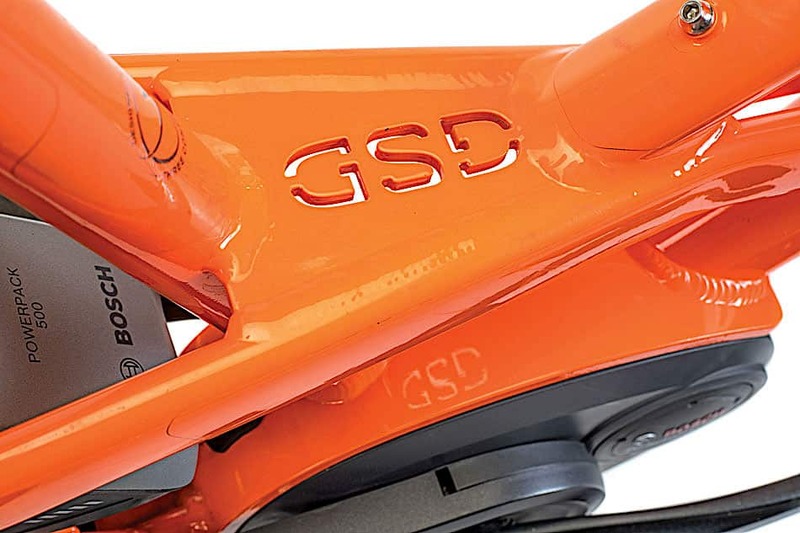 The frame on the GSD has a very unique, patented design, which Tern terms “Multi Truss.” They stretched the rear of the frame with a sturdy ladder-type design that allows for two separate batteries that are protected from impacts by the frame tubing. They went with 20-inch wheels to keep the center of gravity really low. Thru- axles with wider Boost spacing provide extra sturdiness to handle the weight of extra people and cargo. 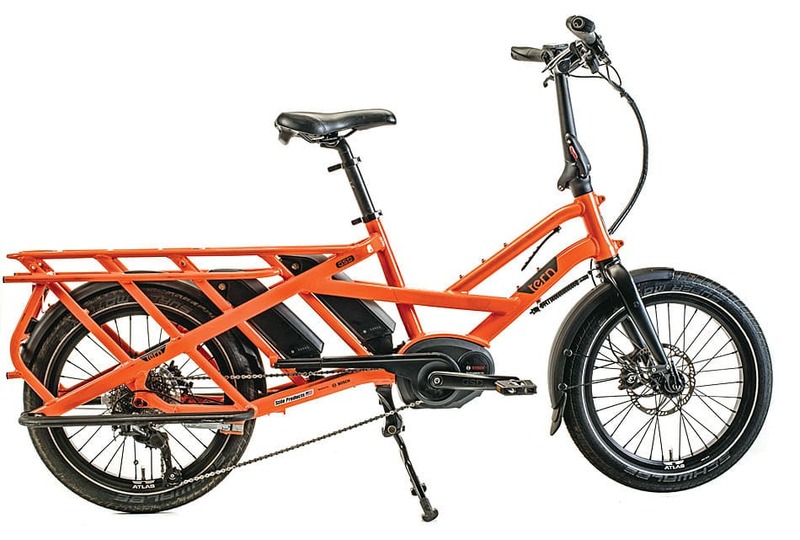 The 49-inch wheelbase is on the long side to help provide more balanced handling, but luckily the bike will still fit most standard (e-bike-rated) bike racks. Lifting the bike up there isn’t easy, as the bike weighs in at nearly 70 pounds sans accessories. 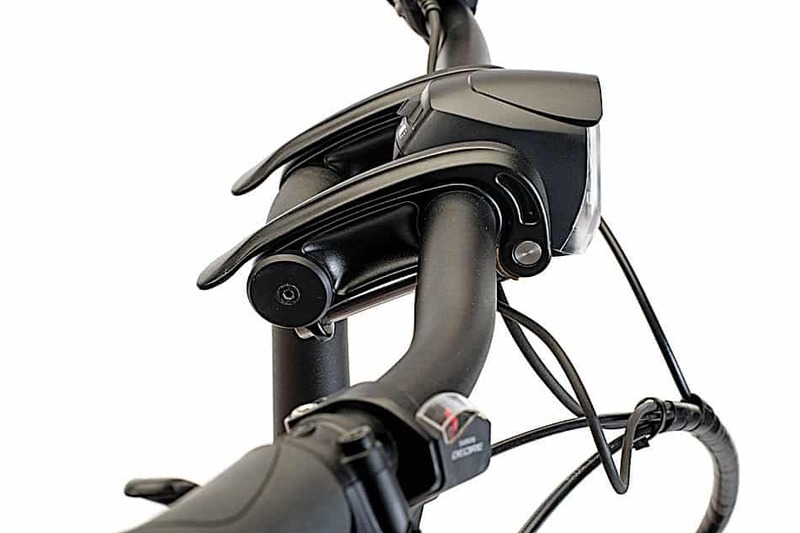 The stem folds down to allow it to easily fit into an SUV or minivan. Speaking of accessories, there’s easy mounting points for up to two Yepp seats in the back, or one Yepp, and an included seat pad that can easily be a seat for an older kid or an adult. 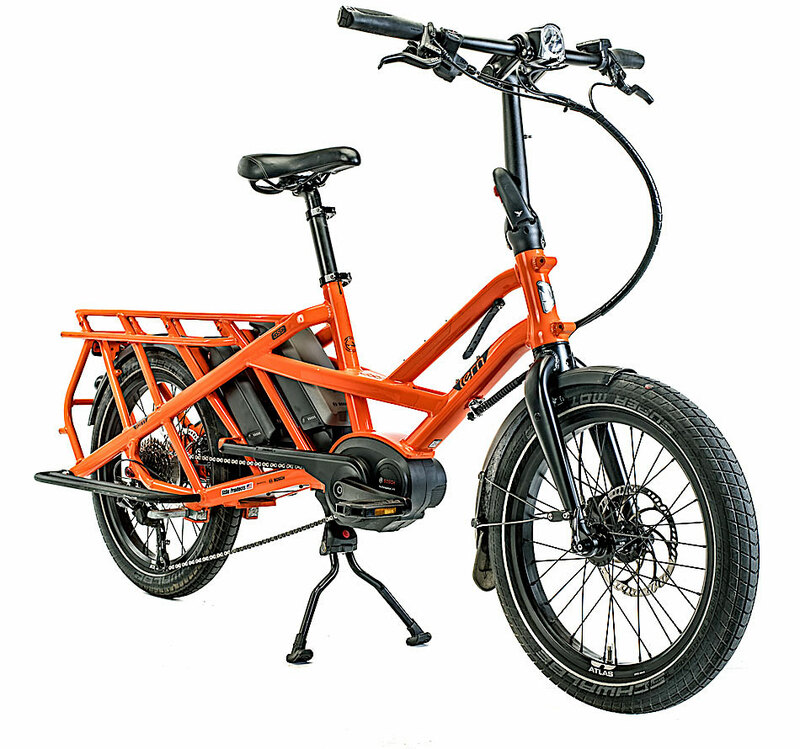 There are Tern panniers and aftermarket ones available, as well as running boards, front baskets, holding rails for the kids and more. There are built-in, spring-loaded footpegs under the chainstays, and our test model came with sturdy Lower Deck bars that allowed even more versatility when hauling friends around. The saddle even has a built-in handle for passengers. Dual batteries offer tremendous range. It’s an $800 option if you get the second battery when you buy it, or just shy of a grand if you buy it separately. 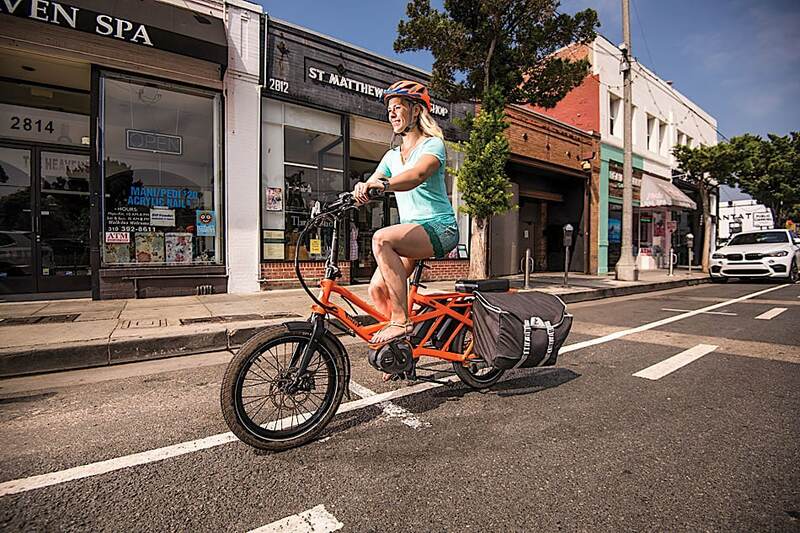 Tern outfitted the GSD with a 250-watt Bosch Performance Line Class 1 motor, which offers plenty of power to get the bike off the line even when loaded to its max weight of 396 pounds. Trust us, we tried it, and it goes easily. for a second one later if you feel you need it. With the dual-battery setup, it automatically switches between batteries for power and charging. The display is a Bosch Purion, one of our favorites because the controls and display are together in one compact unit. Power control is right at your thumb tip. You can see the built-in, spring-loaded footpegs under the beefy, optional Lower Deck that was bolted onto our test unit. The GSD is an amazingly versatile vehicle with a huge range, thanks to the dual-battery setup. This bike is perfect for commuting, but owing to its versatility and carrying capacity, it can even act as a useful replacement for a car. It could easily carry Mom, Dad and one kid on outings, along with everything needed or everything they buy at the market. This would also be an excellent bike for deliveries of food, flowers, even covering a massive paper route! It’s sturdily built, and with the range this thing has, it might not ever need a battery swap on a shift. We like it for its ability to stand and take up less floorspace in an apartment too. There’s some adjustment available for handlebar positioning. It uses two locking levers to make it easy. We used it on longer rides to change position to alleviate fatigue. The integrated rack adds something unique; you can stand the bike up on it. This is useful in two ways. First, Tern designed it to stand this way in an elevator, because many can’t handle the length of the bike. Second, for those of us who dwell in apartments, the bike can be stored this way to take up less floorspace. It’s actually very easy to get it up or down from this position as well. The rear tire, with the rear brake held, is a perfect lever for this. 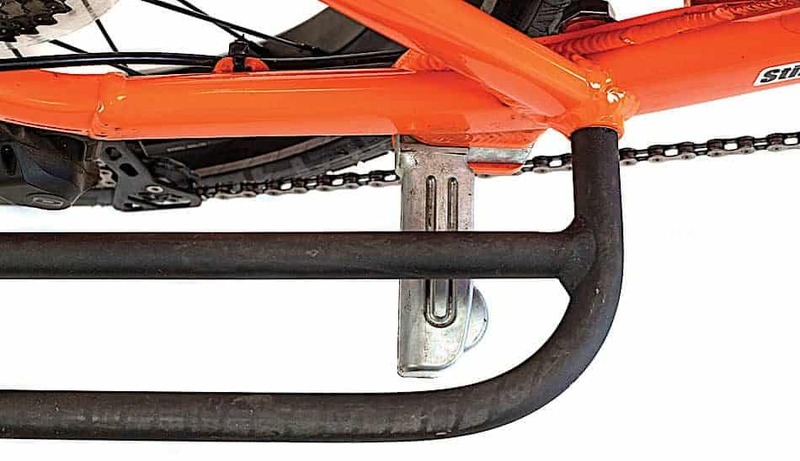 The dual-telescoping seatpost setup can fit anyone from 4-foot-11 to 6-foot-5 comfortably, and the bike has a reasonably low step-through with a 20-inch stand-over height. a leg over. The stem folds over but doesn’t telescope, though it does have a quick-release setup that allows riders to adjust the handlebar position that we found very useful on long rides. 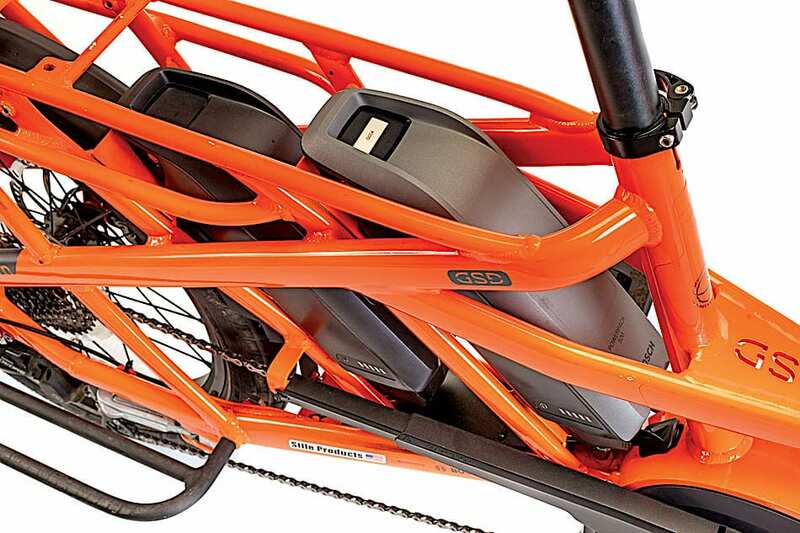 Loading the bike is really easy with the built-in Hebie dual kickstand. It holds the bike upright when parked so you can load the kids, the missus and/ or the groceries. Just get on the bike and push forward and up it goes. This would also be an excellent bike for deliveries of food, flowers, even cove. This bike, despite the heaviness, is very easy to live with. It’s a fantastic grocery-getter that’s fun to ride and really did replace a car for many trips we took while we had it. The combination of the Bosch mid-drive (that delivers up to 63 N/m of torque) and the 20-inch wheels afforded more than enough torque to take off easily, even in lower power settings. Honestly, though, we spent a lot of time in Sport and Turbo modes just because we could. Range anxiety wasn’t an issue on any ride. Thanks to the low center of gravity, the bike is really stable. It doesn’t handle like a barge, despite the longer wheelbase. 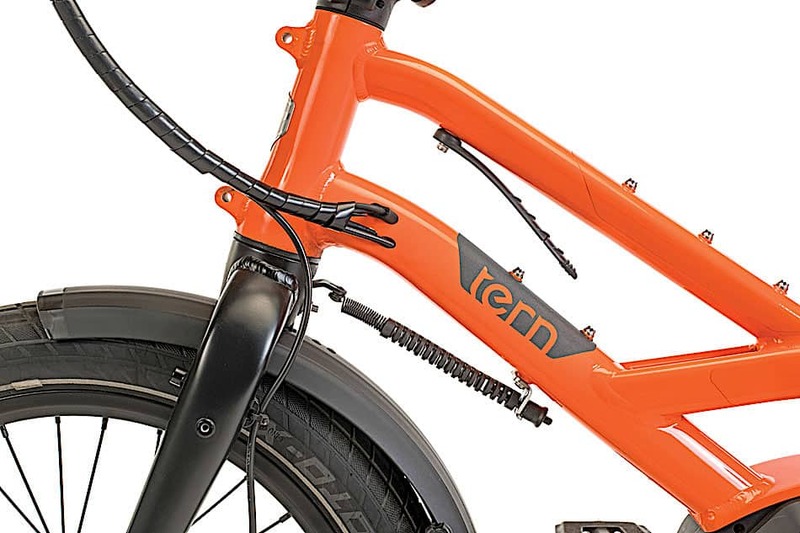 The Tern’s steering is responsive without being twitchy, and the turning radius is really good. Handling isn’t anything you have to get used to, because it feels very natural. The 1×10 (11-36t) gearing was perfect for even the steepest hills we took the bike up. Dual telescoping seatpost that fits riders from 4-foot-11 to 6-foot-5. Loading it up was a cinch, thanks to the dual kickstand. We used this for a lot of farmers’ market runs on weekends. We only had the saddlebags, but they’re spacious enough to carry two to three grocery bags each. There are also platforms that can be added, like a front basket and what they affectionately call a “short bed” that can bolt on to the top of the rack to hold wider stuff. 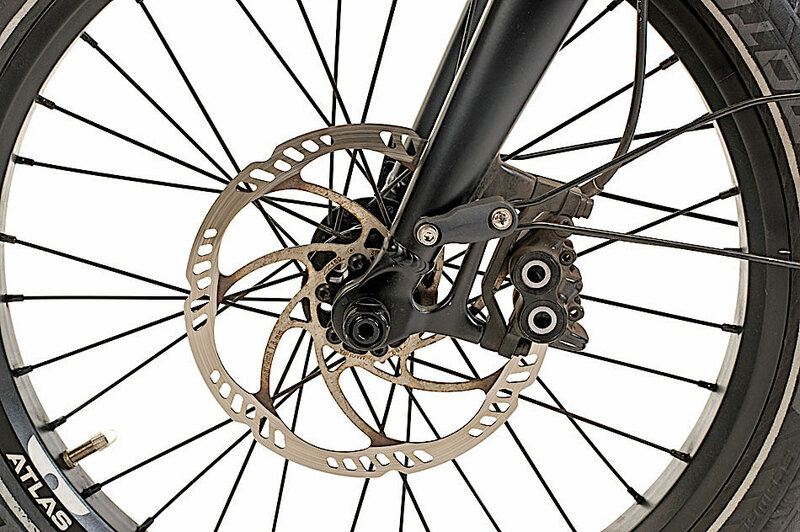 The four-piston Magura brakes ensure you can control and stop this juggernaut when it’s fully laden, even going down a steep hill. We put this to a test, and the brakes stopped us as fast as we wanted to every time. Between the super-stiff aluminum frame and fork and the 20-inch wheels, the Tern was not easy on the bumps. A suspension seatpost would be helpful, but possibly problematic due to the necessity of the telescoping feature. The included padded seat cushion for the back is about 3 percent more padded than the saddle. Be kind to your passengers, and also keep this in mind if you haul fragile stuff. 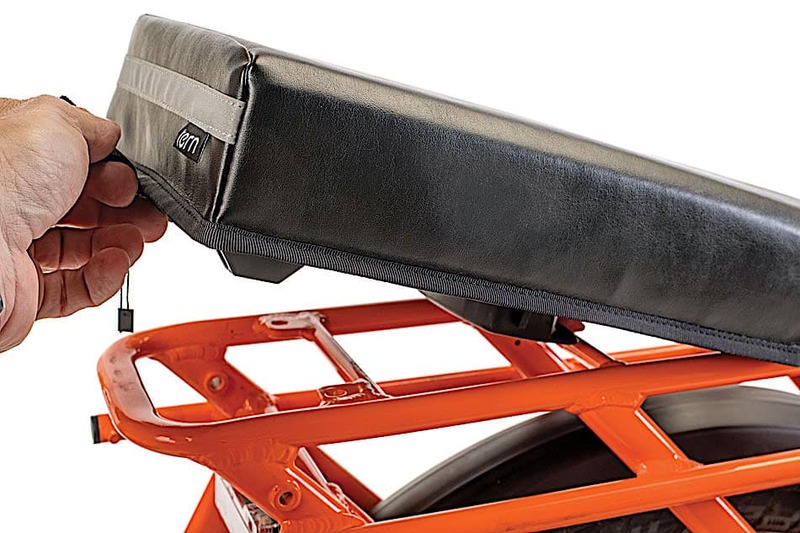 The optional ($45) seat pad is a no-brainer and has a quick-release feature for tools-free attachment. The GSD is an impressive machine. We couldn’t exhaust the batteries on long rides, even carrying lots of added weight. 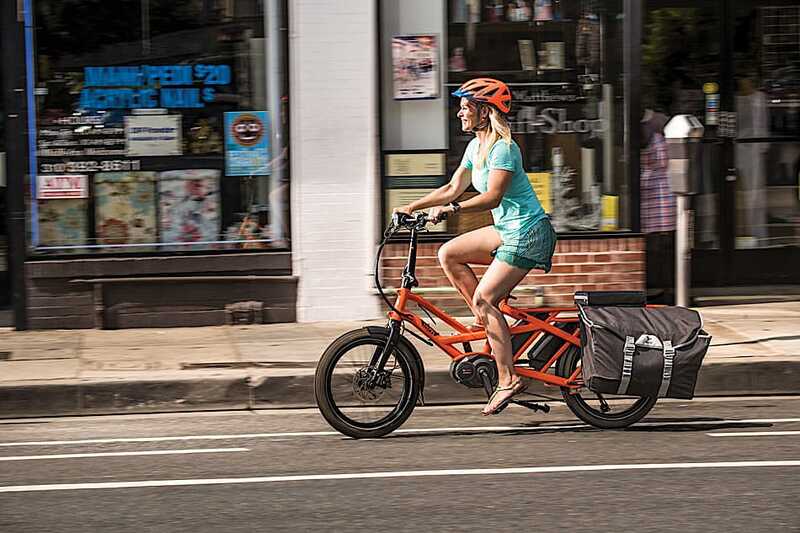 The Tern has the look and feel of a quality build and can be configured in so many ways that it will make you leave your car at home most of the time. This would actually be a great vehicle for a cross-country trip like the one Jon Langille took from Canada to California. Any takers?